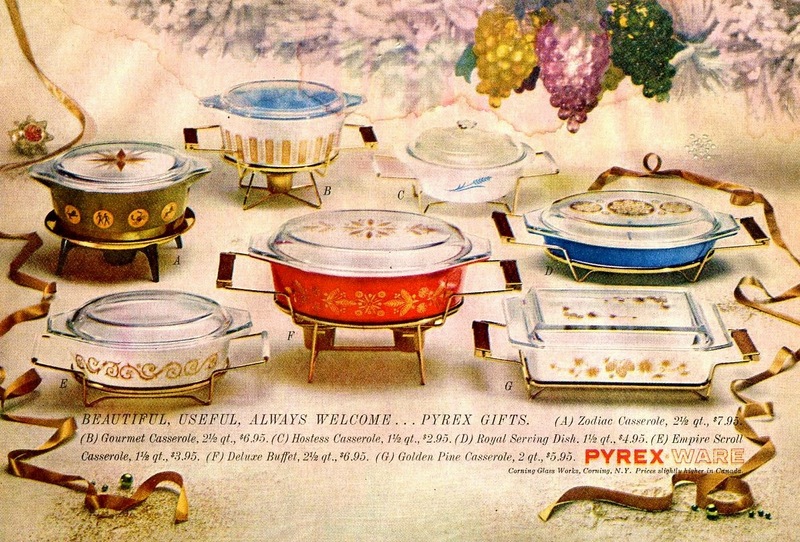 There is so much curb appeal to these Pyrex casserole's with their cradles. And so many to choose from to match any kitchen. Just when I think I have seen the best of them, I come across something amazing in eBay. Oh, my. Of course it is pink. It had to be pink. That is a gorgeous piece of kitchen ware. image from here... and needs a new home! The Pyrex part of this amazing casserole dish... is the clear glass insert. A fantastic divided dish. So using this would make a great buffet server during the holidays. I love that it has a large round plate under it. So you can use it so many ways. As I am thinking nothing could compete with all this gorgeousness... until see this beauty. image from here... and needing it new home! Yep. It even came in turquoise! You know, I am quite fond of Pyrex in turquoise too. Wow - my heart skipped a couple of beats when I saw the pink Pyrex. I almost fell into cardiac arrest when I saw the turquoise Pyrex! I don't think I would have ever seen these had it not been for you. Thank you! And BTW, I don't stop by every day but when I do, I very much enjoy all the vintage ads that you post. You are doing more than posting pretty pictures. You give us a break from the daily grind and allow our imaginations run nostalgic for those times.